On July 1, 2013 the first Kyrgyz Field’s Day, organized by “Automash-Radiator”, LLC was conducted with participation of the Vice Prime Minister – Tayrbek Sarpashev in the field of the farm “Rostik” of Komsomolskoe village in Chui oblast. The goal of this event is to show to managers of households and farms, heads of village’s board, entrepreneurs and representatives of agribusiness of Chui oblast – the working of the modern agricultural equipment in fields’ conditions. During the event there was demonstrated the equipment of leading producers from Belorussia and Russia: “Belarus” tractors, «Palesse GS 812» combines, modern ploughs, cultivators, mowing machines, balers, manure spreaders, and also sprayers and seeding-machines, which are able to carry out field activities according to the highest requirements. The Bank “Bai-Tushum and Partners” also participated actively in this event. Specialists of the Bank provided consultations for everyone on leasing and other banking services. 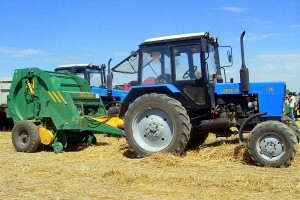 We would like to remind you that in order to support of agricultural sector through updating of equipment, the Bank “Bai-Tushum and Partners” jointly with “Automash-Radiator”, LLC implemented accessible leasing program which allows entrepreneurs to receive financing for purchasing of agricultural equipment for a long-term on profitable conditions. “Within this leasing program farm households and village cooperatives may purchase the equipment of Russian and Belarusian production in the leasing up to 10 million for up to 5 years. The Bank “Bai-Tushum and Partners” may finance up to 70% out of the equipment’s cost, and also 100% out of cost in case of providing of the liquid real estate as collateral”, noted Gulnara Shamshieva, General Manager of CJSC “Bai-Tushum and Partners” MF Bank. Participants of this event had the opportunity to ask all interested questions from representatives of the Bank and to receive the first hand consultations.